Freestate is proud to have had the opportunity to participate in two large projects for Tradepoint Atlantic at Sparrows Point and we look forward to future work on this site! Freestate is working with Local 24 to upgrade their Patapsco Avenue Union Hall building and grounds. 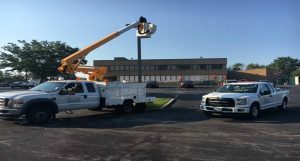 As part of their green initiative Local 24 will be reducing its carbon footprint while enjoying improved safety and security by upgrading the exterior building and parking lot lighting to state of the art LED lighting. The local will benefit from reduced energy costs and will take advantage of available rebates from BGE as well. Plus, the longer service life of the fixtures helps reduce maintenance and replacement costs. Freestate continues to support the efforts of Local 24 to showcase the services we provide in the best possible light. Cole Field House at the University of Maryland officially opened on Wednesday August 2, 2017. Freestate Electric is proud to have been a part of the team that made this project a success! Craftsmen from Freestate Electrical Construction Company were recently honored at the Washington Building Congress’ 61st Annual Craftsmanship Awards this past March for their outstanding lighting work at Trump International Hotel at the Old Post Office in Washington, DC.